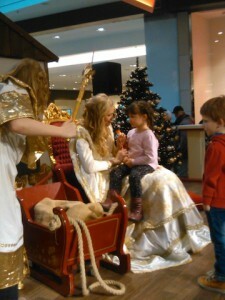 The Christkind is a figure in Germany that brings presents to the children on Christmas Eve, especially in the southern parts of the country. Until the reformation in the 16th century, people in Germany did not give each other presents at Christmas, instead the children received their presents from St.Nicholas (Nikolaus) on 6th December. Martin Luther, however, opposing the catholic saints, apparently introduced the idea of giving presents on 24th December. These were brought by the Christkind, who is often depicted in white and similar to an angel. It is said that it comes in through the window and leaves presents around the Christmas tree, while the children are out of the room.